If the �trip information� screen is displayed, select �past record�. The average fuel consumption history is divided by color into past averages and the average fuel consumption since the last updated. Use the displayed average fuel consumption as a reference. 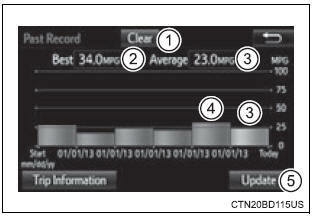 Update the average fuel consumption by selecting "update" to measure the current fuel consumption again. The fuel consumption data can be deleted by selecting "clear". This distance is computed based on your average fuel consumption. As a result, the actual distance that can be driven may differ from that displayed.